The photo may be rubbish, but the dish is anything but. I made this for Meat Free Monday. 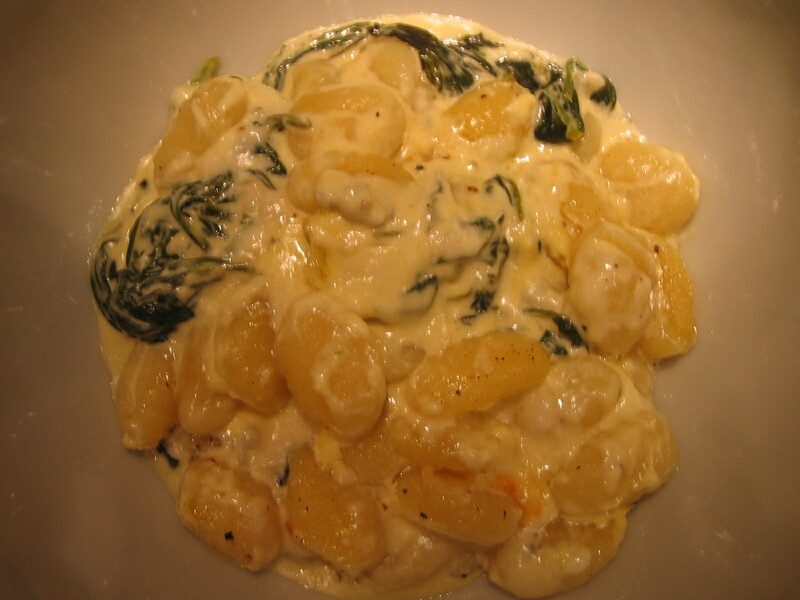 It is far from healthy– there’s double cream, gorgonzola and the gnocchi– but it is delicious. It’s also easy, which is helpful when you’re trying to get back into the swing of things following the Christmas break. In this house, we are doing neither Dry January NOR a detox month, so this was just the ticket for a cold January night. The original recipe calls for spinach, but Nigel helpfully offers up alternatives of purple sprouting broccoli or lightly cooked brussels sprouts. I used tenderstem broccoli, which isn’t purple, but it’s close enough. Three-quarters of this family like spinach, but the remaining one-quarter is a very vocal dissenter in fondness for spinach, and it’s not worth the fight sometimes. The broccoli went a long way to breaking up the richness of the cheese, double cream and pasta. However, after a few bites the younger set found this dish too rich. But the adults loved it regardless. Would I make it again? Most definitely. If you’d like to make this yourself, click through on this sentence to find the original recipe in The Guardian. Anna: Mmm. 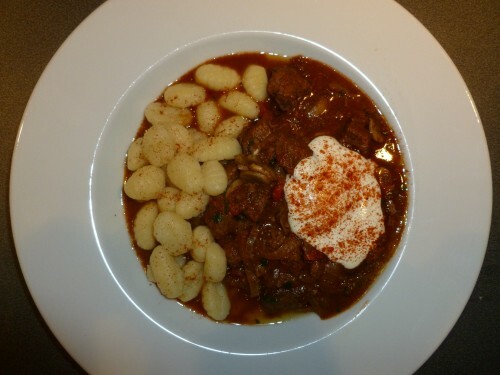 Goulash. I haven’t had goulash since I was working in Prague nearly 2 years ago. And I ate it about five times in 9 days. This actually tastes relatively authentic. 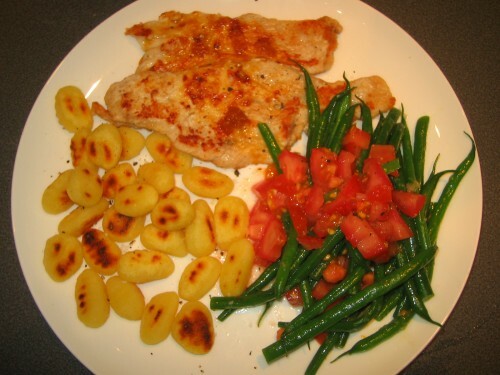 Peter: Is it unusual to have gnocchi with it? You know me, I love a gnocchi. Anna: Well I think it’s Bill’s nod towards dumplings which goulash would traditionally be served with. And I really think it works. Peter: This was a very easy second day supper. And there’s more in the freezer too isn’t there? Anna: Yes. That’s my only criticism of the recipe. The book says it serves 4, but with 1.5kg of beef even four giants would have leftovers. A proof-reading error there I think. Peter: I don’t mind. I like leftovers. Anna: And leftovers ye shall have. Anna: I give in. Work is so busy right now I’m getting sucked into Nigella’s promise of a speedy, tasty dinner on the table in seconds. She’s offering me a solution, our lives are so similar after all! Peter: Well, you both have dark hair. And she also is worth a hundred million. Anna: One and the same we are. I wouldn’t normally go for a recipe like this as it’s not particularly healthy, but needs must. Peter: It didn’t taste unhealthy. We had vegetables with it. Anna: I guess it wasn’t that bad. It involved fried things and I try to avoid fried things. Peter: Well I liked it anyway. The sauce on the scalopinne was a bit sharp with the lemon. Anna: That was probably my fault for not seasoning it properly. I was in such a rush to finish my speedy meal that I didn’t have time to add salt. Peter: I really liked the gnocchi. They were like cheat’s chips. Anna: I have to admit they were a revalation. I like a good gnocchi and these were brilliant. I could have eaten them on their own. In fact, I think I might next time you’re out. Just like Nigella. Now, where’s my silk dressing gown?